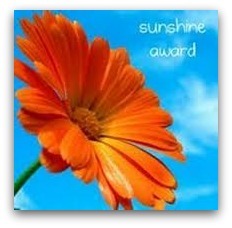 Last week Polly of caughtwriting tagged me with a lighthearted award known as The Sunshine Award. It’s a fun little award/meme that lets me tell you, my gentle readers, a bit more about myself. The rules are as follows: 1. Thank the person who gave me this award; 2. Answer the questions below – its all about favourite things; 3. Pass on the award to other sunshine-y bloggers and tell them about it. Thank you Polly for thinking of me. It’s always fun to find out what other bloggers have to say about the same topics. I think that’s why I like memes so much. They are a pleasant little peek into someone else’s life. Today it is aqua + cyan + teal. Turquoise jewelry. Ocean waves. Soothing and relaxing colors that seem to call to me as the heat of summer is upon us. Cats. First of all I think that cats are very handsome animals. Then, of course, I like how a cat with one disparaging glance can put anyone or anything in its place. Good looks + attitude. What’s not to admire? Eight. What I think is really cool about eight is that if you write it numerically, then lay it on its side, you will have the symbol for infinity. Such versatility charms me. Vodka. Preferably Grey Goose on the rocks with a twist of lemon. It’s a simple and straightforward drink– easy to make, nice to sip, pretty to look when served in a cut crystal tumbler. Twitter, definitely. I find it more informative than FB. I like how Twitter’s 140 character limit forces everyone to get to the point. And it just seems more fun to me. In the moment. A little wacky. Interior design. Over the years I’ve gotten more interested in knowing about design principles & color combos & furniture styles. Then using what I’ve learned I’ve been slowly redecorating our home so the it is more inviting + cheerful + livable. When I’m not stressed out about all the expensive choices I’m making, I rather enjoy being an active amateur interior designer. I find the idea of giving or receiving presents problematic. I don’t enjoy shopping for anything, ever– nor do I feel like anyone needs to give me a present for anything, ever. All of which means that I’m uncomfortable with both the giving and receiving of presents. Truthfully, I’d rather spend time with the people who I love than spend time messing around with presents for them. Tuesday. Don’t know why. I just like it. Lately I’ve been on a daisy and zinnia kick. The former because they seem to grow anywhere– and the latter because I’m determined to get them to grow somewhere. As for passing the award along to other sunshine-y bloggers, here’s what I’m going to do. If you are a self-described ray of sunshine [or you’re looking for something to do on your blog], then by all means do this meme. It’s fun. It’s light. It’s a perfect sort of meme that puts all other memes to shame. YES, gentle readers, this is the meme for you. And with that, I have fulfilled my obligation regarding Rule #3. See you later, meme-a-gators. It’s beautiful outside today– and this little ray of sunshine wants to be out in the garden. The stock market certainly didn’t take kindly to Facebook. I’m not entirely surprised. In fact, I’m rather pleased to see that enough people in this world are aware enough to not waste their money on a company that uses other people’s information somehow to make money. That being said I’ve spent a good part of the last couple days reading about/listening to friends & acquaintances talk about leaving FB now that we’re all learning more about FB’s business model. And because I’ve left Facebook not once, but three times, I have become a voice on this topic. Just call me a Facebook Rejection Early Adopter. Yes, once you leave Facebook you will find out for certain who is your real friend and who isn’t. There will be no doubt about this because the real friends will stay in touch with you via non-FB ways while you will never hear from the faux friends again. And some of the people who turn out to be faux friends will shock you. Leaving you by yourself to wonder how you ever could have been fooled by them to begin with. It’s not a pretty thing to find out– but as they say, the truth will set you free. And free I am out here in the world detached from FB. • Facebook. I was talking with a casual acquaintance the other day. Over the years we’ve gotten to know each other– sort of. She is nothing if not outspoken. Often we talk about FB. It fascinates her that I just left it. Like that. No worries, no looking back. It’s kind of a theme with her. And honestly, I’m fascinated about why she doesn’t leave FB. She hates it– complains about it every time we are together. In fact one of her biggest complaints is that her friends have the audacity to post status updates using words. That they think she’ll read about what they’re doing. This seems to bother her to no end. She mentions it often. So, I asked her straight up why she messes around with something that so clearly upsets her. And she told me that the only reason she stays on FB is so that she can see the photos that her friends post. She wants to see these photos so that she can judge how these friends look. Her word: judge. Being the polite soul that I am, I just nodded my head up & down, mumbled a vague sort of “uh-huh,” and quickly changed the topic of conversation to something that didn’t give me a glimpse into the psyche of someone so shallow– and probably– more typical than I care to admit. According to this article, researchers posit that this perception is due to the fact that people see all sorts of happy photos that FB friends post. Then these people assume that other people are having a better time than they are. Enter bitter feelings. Wonder if that is what’s going on with my acquaintance… seeing how she is a nut for photos. • Flow charts. 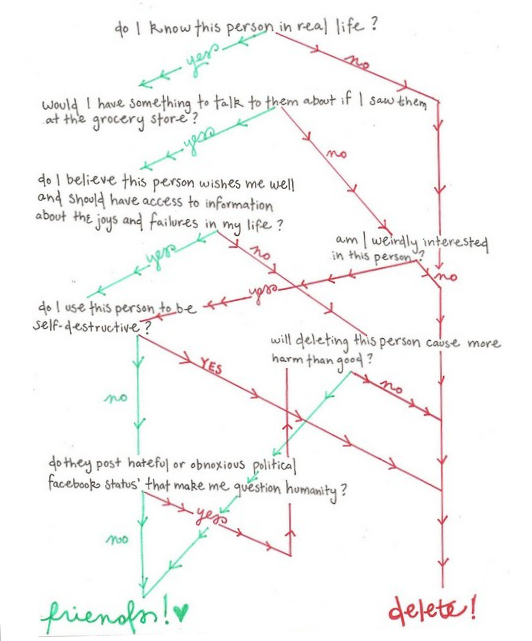 While I was enjoying all that Pinterest has to offer, I came upon this wonderful How to Delete Half Your Facebook “Friends” flow chart. It is by a blogger named Samantha who keeps a blog called ashore. I love this chart. Now I just need to get my acquaintance to understand it and use it. Might make her happier about her experiences on FB. Maybe.